This page was originally created by Frank Bland for his WhyADuck site. Here's a page where which shows off photos taken by fans of The Marx Brothers. 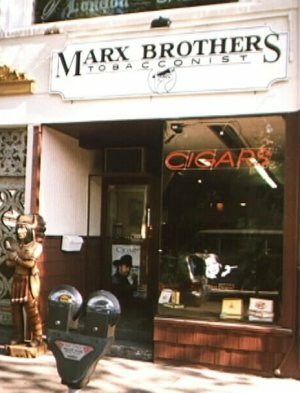 These photos can be of any Marx-related activity; whether you or your friends or family are dressing up as one or more of the brothers or if you're just getting together with other Marx fans, I'm happy to display the visuals here for all to see. Send me an email and we'll work it out. 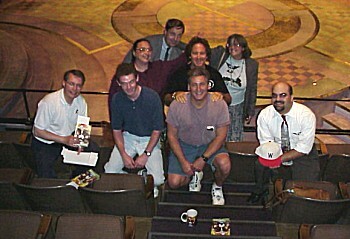 For the 1999 Open House, Paul W. also arranged a group trip to the Arena Stage in Washington, D.C., for a performance of Animal Crackers. While I was unable to attend the performance (and I haven't yet processed the photos from the open house), Pete Generous was kind enough to send me one of his photos from the theater gathering. 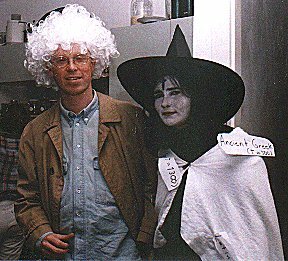 On December 13, 1998, we were blessed with the arrival of Marx writer/enthusiast and general spiff, Jay Hopkins (former editor of the Fanzine, Re:Marx and donator of an exhaustive listing of Marx Television Appearances to this site). In honor of this occasion several of us got together for lunch and chit-chat. As an extra added bonus, Robert Bader (editor of the book, Groucho Marx and Other Short Stories and Tall Tales) showed up and invited us all to a Marx TV viewing at his home later in the evening (Kathy and Frank were, unfortunately, unable to attend). A good time was had by all! Here's a group of the usual suspects standing outside what has become a regular Marxist gathering place, the Edison Hotel Restaurant in NYC. From left to right, we have Chris Hamilton, Ed Grant, Rob Bader, Susan Kaplan (in her catcher's stance), Kathy Biehl, Kellie Schirmer, Jay Hopkins, and Cary (a.k.a. "Zorroman"). 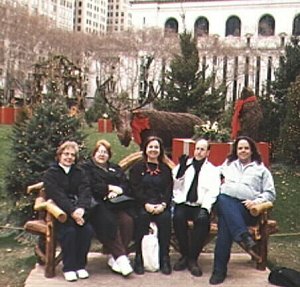 After some stimulating lunch conversation, we adjourned to Bryant Park for this photo op (notice the back of the New York Public Library in the background). From left to right, we are Susan, Chris, Kathy, Jay, and Frank (who's put on entirely too much weight recently). 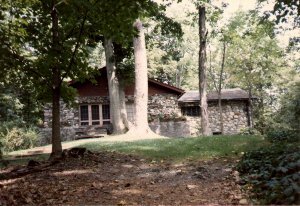 On Sunday, August 3, 1997, several dedicated Marxists gathered for the first of what we hope to be many gatherings. We met at a restaurant in midtown Manhattan for lunch and idle chitchat. 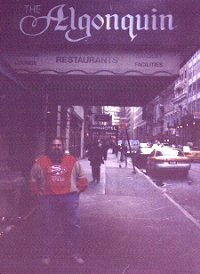 From there we visited the famous Algonquin Hotel where Harpo Marx regularly joined such luminaries as Woollcott, FPA, Broun, Swope, Benson, Benson, Benson, Benson, Benson, and Benson for meetings of the Thanatopsis Inside Straight and Literary Club. 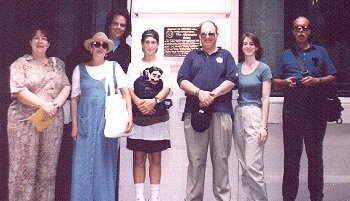 Afterwards, we retreated to Bryant Park for yet more chitchat and finally three of our number finished up the afternoon with a visit to the Marxes' childhood home at 179 East 93rd Street. Below are a few photos from this gathering. 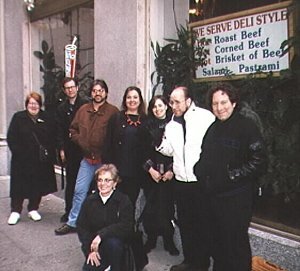 Here we are standing outside the Algonquin Hotel, with the plaque illegible in the background. From left to right, we are: Chris, Susan, Frank, Andrew, Groucho (in Andrew's arms), JJ, Teej, and JB. JB just remembered that he left his car in a loading zone. 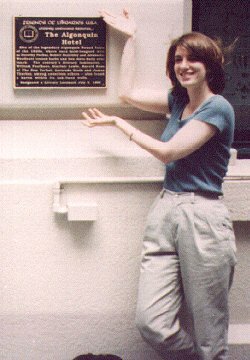 Here is Teej, the proprietor of the Marx Brothers Mailing List, highlighting the aforementioned plaque. At least in this shot you can tell that we were actually at the Algonquin. I'd like to buy a vowel, please. 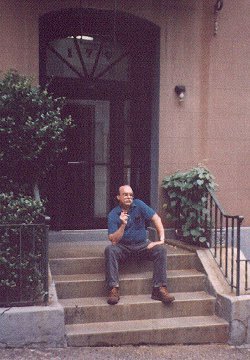 Here, John Benz Fentner relaxes with a stogie on the front stoop of 179 East 93rd Street, the Marxes' home around the turn of the century. 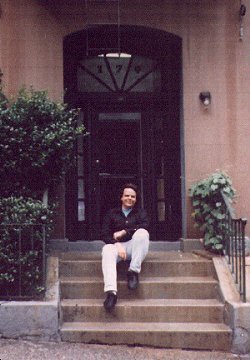 And, finally, I handed my camera off to JB to take a picture of me on the same stoop. As you can see, I'm signalling for JB to throw a slider. Well, that's about it from me. However, you may wish to see further shots from this gathering, supplied by JB, as well as Teej's shots of our Philadelphia gathering two weeks later with a slightly different crowd. 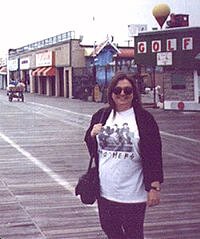 Kathy Biehl poses in her Marx Brothers t-shirt on the Ocean City, NJ, boardwalk as we wait in anticipation of the 13th Annual Ocean City DooDah Parade (honoring The Marx Brothers). A Marx Mailing List subscriber who goes by the name "Flatbush Escapee" was caught on film in front of the Algonquin when I met him for lunch at the nearby Edison Hotel restaurant. 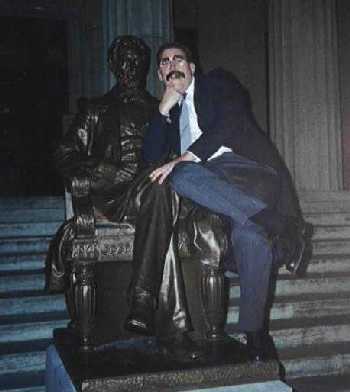 Duck Lister, Willy, contributed a photo of himself in Abe Lincoln's lap at the Buffalo Historical Society on Halloween in 1999. The occasion was a friend's wedding reception, and I'm just wondering how the bride and groom were dressed! Here's Donn Osier trying, in vain, to gain entry to a speakeasy. Professor Wagstaff asks him for the password, and all he can think of to say is, "Whatever it is, I'm against it!" 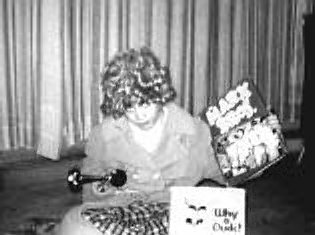 Jena Santorelli took this picture of her friend, Diana, dressed as Harpo and forwarded it for our enjoyment. 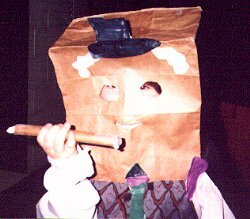 This precocious child designed, made, and wore his own tribute to Harpo Marx for Halloween 1997. Note: that's not a cigar he's holding; that's a candle burning, appropriately (for those of you familiar with the film "Horse Feathers"), at both ends. Note also the size of the mouth hole in the mask, which enables the easy insertion of an oversized lollipop. Thanks to Sword Fish (Aimee when she's at home) for sending this pic along! Following a wine-tasting trip to the North Fork of eastern Long Island, Kathy and I decided to return via the scenic route, along Route 25A. As we were motoring down Main Street in Huntington, Kathy noticed this familiarly-named smoke shop. One day I must return to talk to the owner. 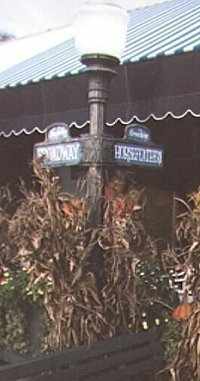 On route 9 in Tarrytown, New York, stands a restaurant called Horsefeathers. Unfortunately, my flash wasn't working when I went on this photo excursion, so this is the only shot that really came out; a picture of the street sign out front, proclaiming this address as the corner of Broadway and Horsefeathers. The inside of the place is worth noting, too, as it features a mural along one wall with caricatures of several luminaries, including (amont others) W.C. Fields, D.H. Lawrence, Mark Twain, Kurt Vonnegut, and Groucho himself. The food is pretty good, too, as is the extensive selection of beer and single-malt scotches. 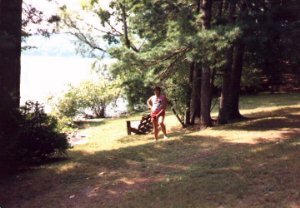 In the 1920's, Alexander Woollcott and a few of his pals pooled their resources and purchased Neshobe Island, eight acres in the middle of Lake Bomoseen in Vermont. It was here that Harpo Marx spent a considerable amount of time in the 1920s and 1930s playing croquet, cards, and "Murder" with Woollcott and several other luminaries. Pete Generous has visited this island several times, and here are a few photos. Here's a beautiful shot of the club house, which was built shortly after Woollcott et al took possession of the island. Another section of the island, featuring Pete Generous himself (Pete is the unrecognizable figure in the center). Finally, here's a shot of the fabled croquet lawn, with the back of the clubhouse in the background. 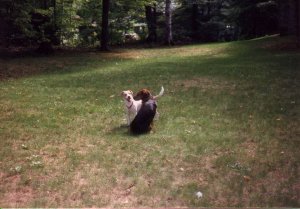 The white terrier is Pete's dog, Mollie; Pete believes the other dog belongs to the caretaker "or just a really strong swimmer from the mainland." Mark Sawyer-Daily is one of those lucky (not to mention talented) Marx fans who occasionally gets to portray his heroes onstage. Above you can see Mark (at right) as Harpo in a scene from The Cocoanuts, in which he appeared (with Jerold Goldstein (left) as Chico and Peter Zapp as Groucho) in a 1993 production of the acclaimed Actors Theatre of Louisville. But Mark's fandom doesn't only manifest itself in playing Harpo on stage. As you can see from the photos below, Mark now wears Harpo proudly on his chest! 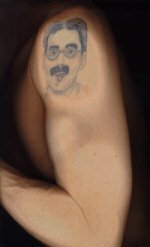 Brad Main has shown his dedication to the Marxes by wearing his Groucho on his sleeve, so to speak. I'd like to know how he managed to lie down on the scanner to create this image! By the way, Brad's site, Groucho Marx Slept Here features a number of great sound files and is well worth a visit!